Star Trek Online will drop players into a brutal war between Gingerbreadman and Snowman, from which nobody can emerge unscathed or lacking a festive spirit. With decades of lore behind it, the tone for Star Trek is pretty much set at this point, Abramverse movies notwithstanding. At its core, it's all about the spirit of exploration, the triumph of the human spirit, and breaking up the seasonal conflict between Gingerbreadmen and Snowmen. Don't feel too bad if you can't remember that epiosde; I'm actually referring to Star Trek Online's upcoming Winter update. 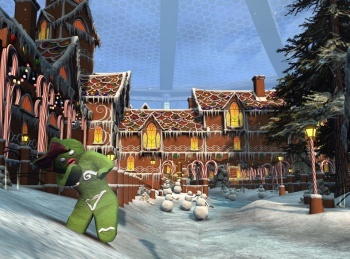 Following up last year's celebration, players can soon return to Q's Winter Wonderland, where the Gingerbread Colony needs captains to defend it from a frozen threat. Star Trek Online players can be transported to the Winter Wonderland by speaking with Q on Qo'nos, Earth Spacedock, or New Romulus Command. Once there, captains at Level 10 and above can queue up for "Winter Invasion", the holiday event set in Q's Gingerbread Colony. Players of all factions can fight off Snowman forces brutally oppressing the Gingerbread populace, eventually culminating in a boss fight with a deadly Yeti. As a bonus, hidden within the colony is a Winter Holiday Recipe. Taking this recipe to the Winter Wonderland Chef activates a mission that rewards players with holiday food and commodities, some of which can be traded for costumes and prizes. Star Trek Online's Winter Wonderland brings back all of last year's events as well as new additions like a pie-eating contest. The rewards for participating in Wonderland events sound pretty impressive too, including pictures of Q that can be exchanged for a new starship, one that I hope has a giant Rudolph nose across its bow. That being said, Winter Wonderland is a limited time event, running from December 5th to January 16th. Get your fill of science fiction festivities while you can!